Do I Have the rights to hire an attourney for my child? Yes, every juvenile charged with an offense has a right to have a lawyer represent him/her in juvenile court. Parents often hire an attorney to represent their child. But even if the lawyer is hired by the parent, the lawyer’s ethical obligation is to represent the child. If the parents’ desires conflict with the desires of the child, the attorney has the duty to represent the child. Is my child required to have a lawyer? In certain cases a juvenile may make a voluntary and knowing waiver of the right to counsel. This depends upon the age of the juvenile, the child’s education, the child’s knowledge of the nature of the charge and right to remain silent, methods used in questioning the juvenile while the case was being investigated, and whether the case presents complex legal questions. If a juvenile does not want an attorney, this should be brought up to the court at arraignment. However, a parent does not have an absolute right to waive an attorney for their child: WHERE THE JUVENILE IS LIKELY TO BE FACING A LENGTHY TERM OF COMMITMENT OR BOOT CAMP, THE JUDGE ALWAYS REQUIRES THE JUVENILE TO CONSULT WITH AN ATTORNEY EVEN WHERE THE CHARGE MAY BE ADMITTED. If I can not afford to hire a lawyer, how do I apply for an appointed lawyer? The Clerk of the Juvenile Court has application forms. You will need to provide information about income, number of dependents, and special needs. Who Qualifies for an appointed lawyer? In cases where a juvenile and his/her family cannot afford to hire a lawyer, a representative of the court will confidentially determine whether the child qualifies as an “indigent person.” OCGA § 15-11-6(a) defines an indigent as one who at the time of requesting counsel is unable without undue financial hardship to provide for full payment of legal counsel and all other necessary expenses for representation. The Court follows the Federal Health & Human Services Poverty Guidelines. Even if the family is not below the income guidelines, an attorney may be appointed in appropriate cases. Do I get to choose the appointed lawyer that I want? No, the Court assigns the lawyers. Every lawyer on the appointed list is experienced in juvenile court matters and highly qualified to represent juveniles. Why does my child have both an attourney and a court appointed guardian? In cases where the parent is the complainant, or where the parent is a witness against the child, the court is required to provide counsel and a person to represent the best interests of the child in court. Sometimes the child’s attorney can zealously represent the child and represent the child’s best interest, but sometimes there is a legal conflict between these two positions. If the child’s attorney notifies the court of a conflict, the judge will appoint another trained individual, either an attorney or a qualified non-attorney Guardian Ad Litem (some of these are citizens called CASA.s “court appointed special advocates”) to represent the child’s best interest. If a juvenile is appointed an attorney, will the fees have to be reimbursed? Attorneys agreeing to serve as appointed counsel are doing “pro bono” [public good], but they are reimbursed by the county for a fee of about one-third of their normal hourly fee. OCGA § 15-11-8 provides that after notice to the parents or custodian, and affording then an opportunity to be heard, the Court may order the reimbursement of reasonable expenses of appointed counsel. What are the age limits for juvenile court? If a child is delinquent, the maximum age will be 17 years of age. If a child is deprived, the maximum age will be 18 years of age. What are the forms of payment accepted by the Juvenile Court? All fees and fines can be paid to the Clerk of Court by cash, money order or certified check. A receipt will be issued for all payments. Where do I pay fines or make restitution payments? Payments are made at the Cashier’s window on the first floor of the Juvenile Court building. The window is staffed from 8:30 am until 5:00 pm. Can I pay fees or fines by personal check? No. Acceptable payments can be made in the form of cash, cashier’s check or money order. For further information on acceptable payment methods, contact the Juvenile Court, Clerk of Court’s office at 404.294.2749. I haven't received restitution from a juvenile in a while. Where can I find out if they are making payments? 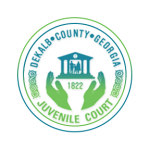 Contact the Juvenile Court Accounting Division at 404.294.2778 or via email at amthomps@co.dekalb.ga.us In order to expedite the process, please have the name of the Juvenile and/or a case number. My child has run away from home or left home without my permission—what can I do? If your child is under 18 years of age, contact your local police department and file a missing persons report, and receive a report number. You can file a runaway complaint by coming to the Court’s Intake Department and providing us with the missing person report number or calling us at 404.294.2769 for additional information. My child is disrespectful and disruptive in the home and will not listen to me—what can I do? You can come by the Court and sign up for the Status Orientation program. The Status Orientation program is designed to provide a unified effort in informing & providing resources for parents with youth displaying ungovernable/unruly, domestic delinquent and/ or runaway behaviors. At completion of the orientation the parent will have the opportunity to request further services from the Probation Department. I want to file criminal (delinquent) charges against a child—how do I do that? If the offense occurred in DeKalb County, our Intake Department will assist you in filing a complaint –you must know the child’s complete name and address. My child refuses to go to school and wants to drop out—can the court help me? Children under the age of 16 MUST attend school, and parents are responsible for making sure they go—if your child misses 10 or more days of school without a legal excuse, he/she is considered truant. The Juvenile Court has a Truancy Intervention Program and Youth Achievement Program to help children get back into or remain in school so they can get their diplomas. In addition, the DeKalb County school system offers alternatives to traditional schools such as open campus, night school, GED programs. Call 678.676.1200 for further information. My child is either using drugs or has some mental health problems—where can I get help? The Juvenile Court offers many programs and services for children and families with drug or mental health problems. You may also contact the Community Service Board at 404.832.4646 for assistance. I am the victim (or witness) in a case—how can I find out what is going on with my case? You can contact the District Attorney’s office at 404.294.2720 for an update. I am financially, physically, or otherwise unable to care for my child(ren) at this time—is there anyone who can help me? You can contact the Department of Family and Children Services (DFCS) at 404.370.5251; they can provide you with services and assistance. Adjudication: Like a trial; the hearing in which a judge listens to testimony and declares if the alleged charges are true. Affidavit: Written statement of facts; the person who signs the affidavit swears an oath that the information given is true. Allegation: A charge or claim made against someone. Appeal: A complaint to a higher court asking to overturn the decision made by a lower court. CASA (Court Appointed Special Advocate): A specially trained community member who is selected by the judge to advocate for the best interests of the child. 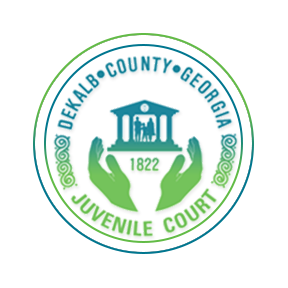 Chief Judge: The judge who has primary responsibility for the administration of a court, but also decides cases; chief judges at DeKalb Juvenile Court are voted on by their peers every four years. Child Abuse: When a parent or caretaker intentionally injures a child; when a parent or caretaker intentionally neglects or exploits a child; any sexual abuse or exploitation of a child. Child Advocate: Attorney assigned by the judge to represent the best interests of a child; the child advocate does not work for DFACS or for either parent of the child. Citizen Review Panel: A group of trained community members who review the progress a family is making on their case plan and report those findings to the judge. Complaint: A formal charge or allegation made against another person. Court Administrator:The manager of the administrative, non-judicial affairs of a court, such as budgets, personnel, and court schedules. CPS (Child Protective Services): The section of DFACS that responds to initial complaints of possible abuse of deprivation. Custodian: Person who has been given physical custody of a child and is required to provide for that child’s needs and safety. Delinquency: Juvenile actions or conduct in violation fo criminal law and, in some contexts, status offenders. Delinquent: Juvenile who has been adjudicated by a judicial officer of a juvenile court as having committed a delinquent act. Detention:A place of confinement for juvenile offenders. In Georgia the places of detention are operated by the Georgia Department of Juvenile Justice. DFACS (Division of Family And Children Services): A state agency under the Department of Human Resources that provides child protection services and case management services families. Disposition: Hearing after the adjudication to determine where a child will live while the parents complete the case plan. Foster Care: State licensed temporary home, group home or shelter where a child may stay during court proceedings and while the parents work on the terms of the case plan. Guardian: Person, other than the parent, who has legal responsibility for a child. Hearing: A trail or proceeding before a judge. The territory, subject matter, or persons over which lawful authority may be exercised by a court. A man who is not married to the mother, but acknowledges paternity and legitimates the child through a court action; or administratively at the hospital. A biological father who acknowledges paternity and marries the mother. Note: Naming a man as the biological father on a birth certificate, merely determining paternity through a blood test or ordering him to pay child support does not necessarily make him a legal father. Legitimation: The process in which a man acknowledges paternity and establishes a legal father-child relationship. Mandated Reporter: A person required by law to report suspicion of a child abuse; this includes doctors, nurses, teachers, police officers, childcare providers, and others. Mediation: Alternative to court proceeding where families try to reach solution on their own; an impartial mediator leads the session and helps the parties come to an agreement among themselves rather than having a judge decide. Non-Reunification: A plan in which custody will not go back to the parents; in some cases, non-reunification plans may precede a termination of parental rights action. Party: Either the petitioner or the respondent in a lawsuit. The parties to a deprivation case are DFACS, parents and the child advocate. Permanency Hearing: A hearing after the disposition to determine what the permanent plan for the child is going to be; Federal law says this hearing must take place no later than 1 YEAR after the day a child is taken into custody. Petition: A legal document that states the reasons the court should get involved in a matter and asks the court to take a certain action. Petitioner: Party that is making the claim of abuse or deprivation against the parents. Punitive:An act inflicting or intended as punishment. Records:All deprived children, unruly children, and first offender delinquent children (except designated felons) have a right to limited confidentiality of their records. The public has access to the complaint, petition, and dispositional order of any child who has been previously adjudicated delinquent and commits a second delinquent offense, or of any child who is charged with a designated felony. Runaway child:Can be placed in foster care home, child welfare facility, OR securely detained for as long as it takes to return child home, or to ensure the runaway child’ s presence at a scheduled court appearance (only when the child has previously failed to appear for a scheduled court appearance). Respondent: Person against whom allegations or charges are brought. SAAG (Special Assistant Attorney General): the lawyer who represents DFACS. Status Offense: Act that is declared by statute to be an offense but only when committed by a juvenile. It can be adjudicated only by a juvenile court. Seven Deadly Sins:Youth charged with one of the following crimes will be transferred to the Superior Court for adjudication and can be convicted as an adult. Status Offense:Status offenses are offenses that are only crimes if committed by children, such as skipping school, running away, breaking curfew, and possession or use of alcohol. Subpoena: A legal document requiring a person to come to court; if you get a subpoena, you must come to court. Summons: A legal document notifying you of a court case and telling you when to come to court. Taken Into Custody:To deprive a person of liberty by legal authority. Children are not arrested, but they may be taken into custody, which is also known as being detained. TPR (Termination of Parental Rights): Legal and permanent severance of the parent-child relationship; if parental rights are terminated, the child may become eligible for adoption. Wanders or loiters about the streets, highway, or any public place, between the hours of 12:00 Midnight and 5:00 A.M.
Has committed a delinquent act and is in need of supervision, but not of treatment or rehabilitation.